Poland and Czech Republic. We’ve visited both of them for their world-famous historical cities for the first time. Krakow and Prague. We were blown away. Yet we didn’t really know other places worth visiting in these countries. Maybe Warsaw, the capital of Poland? So we ended up doing a road trip this spring and visited Warsaw, Łódź and Wrocław in Poland. We were blown away again. And we started to suspect the reason why we’ve never heard about too many famous places in these countries. Sorry for the cliche, but the truth is: Poland and the Czech Republic are both full of hidden gems. We are aware how overused this word is to describe places and make them even more appealing to enthusiastic travelers. Also, the irony in this is that once people start writing about hidden gems they are not hidden gems anymore. But all the same. 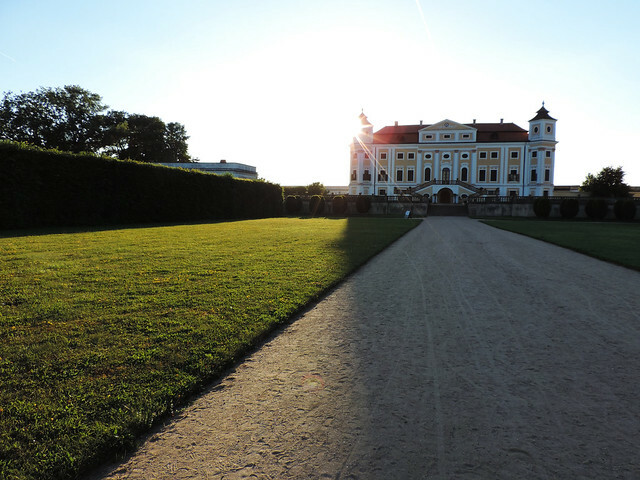 We returned to the Czech Republic this summer and found our breathtaking hidden gems in Moravia. Moravia is one of the three historical regions of the Czech Republic – one that is so rich in both cultural and natural treasures! 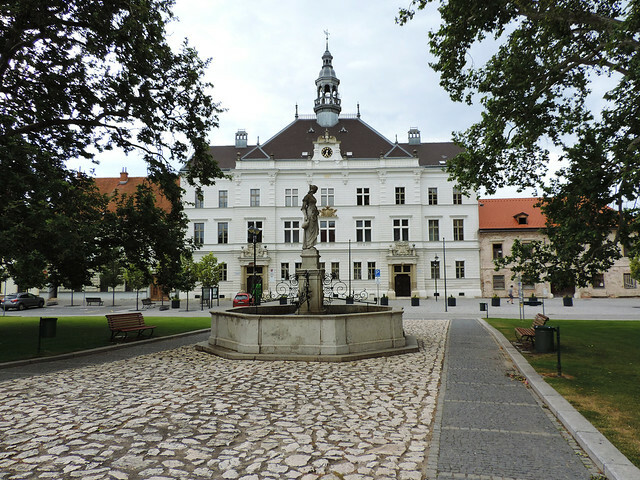 It was a crown land of the Lands of the Bohemian Crown from the 14th century, then it became part of the Holy Roman Empire and later the Austro-Hungarian Empire. During the early 20th century, Moravia was part of Czechoslovakia and when it was broken up into Czech Republic and Slovakia, Moravia remained part of the Czech territory. This relatively small region is home to four UNESCO monuments and even more not so well-known treasures. 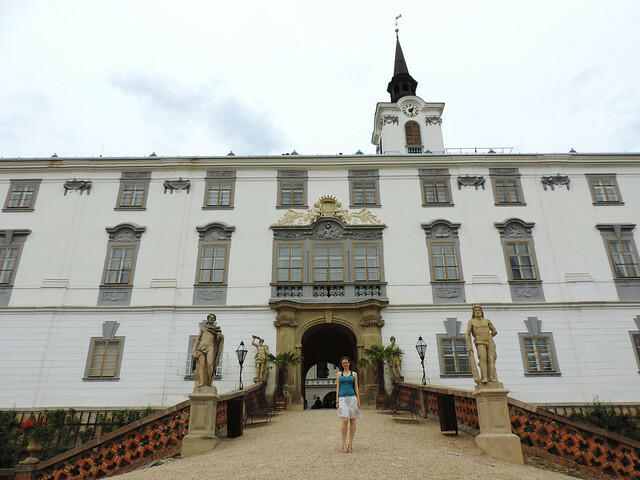 We drove through sun-kissed vineyards, lush green forests and hills and we felt like every inch of Moravia has a secret to be revealed: castles, gardens, parks, ruins, caves, lovely towns… History is everywhere. And tourists? We were surprised how few foreign tourists we encountered. We were mostly surrounded by locals or Czech visitors. On some of the narrow country roads we barely met anyone at all. In fact, the paved road itself disappeared from time to time. Sometimes we had the feeling that the narrow, abandoned road we chose couldn’t lead anywhere particularly interesting and then we bumped into another majestic castle. 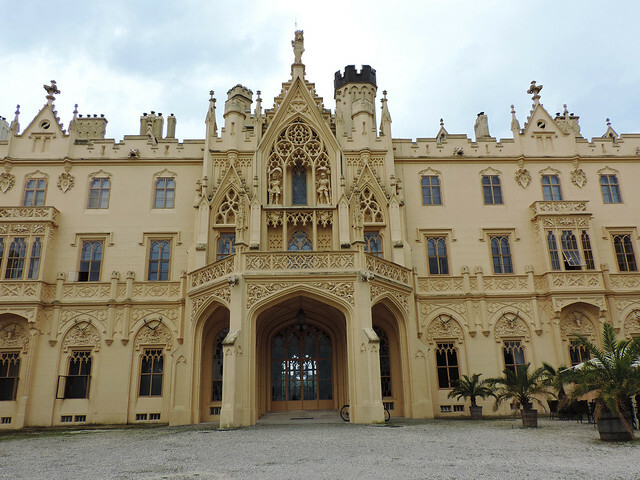 The Neo-Gothic palace of Lednice is probably our favorite attraction in Moravia and one that made us feel like we are back in the Loire Valley on a hunt for fairy tale castles. 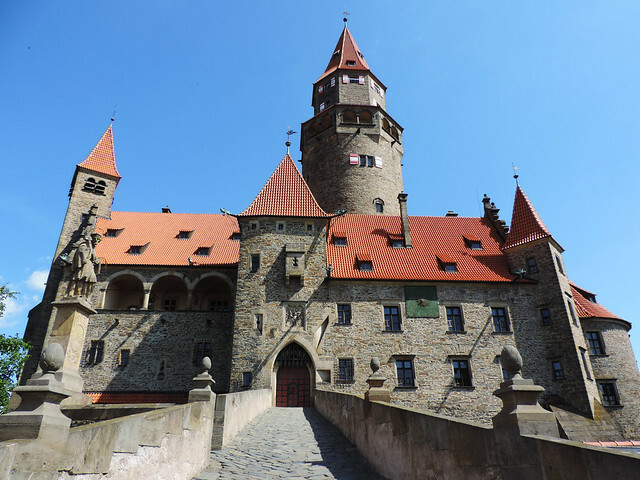 We were so amazed when we saw the castle that we signed up for two different tours to see its interior. And the conclusion: it’s just as amazing from the inside! Then comes the garden. The pretty formal garden is right next to the castle but it’s just a small part of the actual castle park. It’s easy to get lost in this landscape where you bump into minarets and castle ruins occasionally. 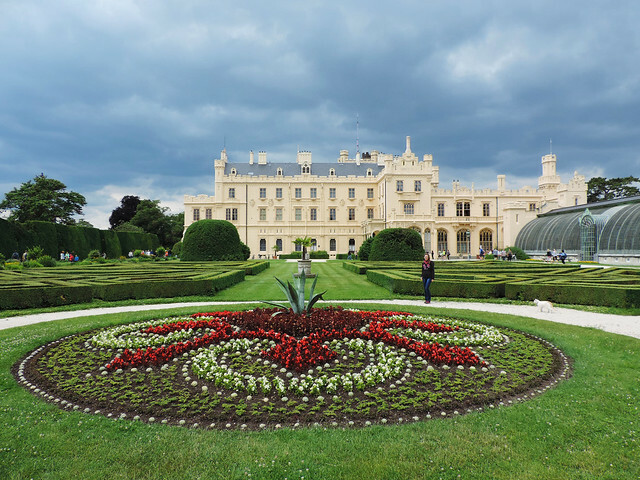 We’ve actually already written an entire post about Lednice – read it here! Lednice has a neighbouring small town, to which it’s connected by a 7 kilometres long lime-tree avenue: Valtice. Its impressive Baroque residence was once the seat of the princes of Liechtenstein, today it’s part of the UNESCO protected Lednice–Valtice Cultural Landscape. Personally, I’d prefer Lednice as my seat as a princess, but to each his own. 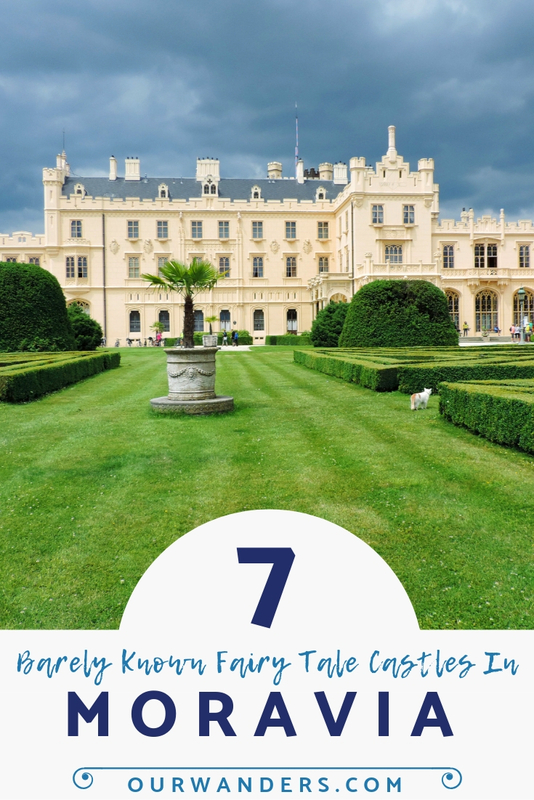 😀 Anyway, we spent enough time at Lednice to miss the interior tours of Valtice Castle. But we could still see it from the outside and walk around in the park. Originally built as a Renaissance castle but later rebuilt in Baroque style, Milotice Castle is about half an hour drive from Lednice. The four-winged chateau has its own charm but we liked the gardens just as much: the inner courtyard, rose garden, French baroque garden, orangeries and a large English park. Moravia’s largest city and historical capital is Brno. 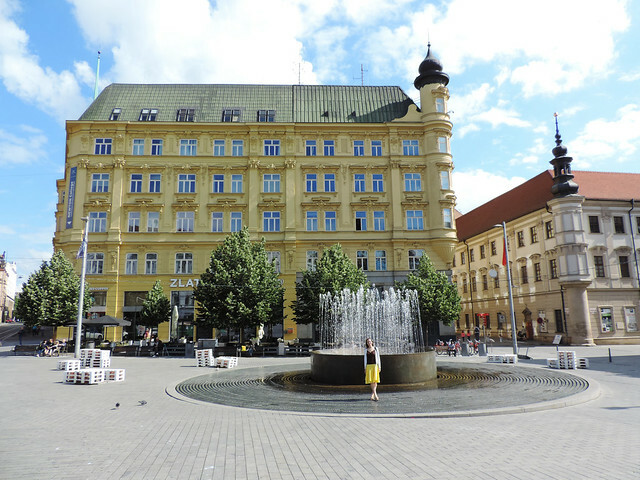 It’s also the second largest city in the Czech Republic. But what is even more important: it’s such a lovely, lively city! 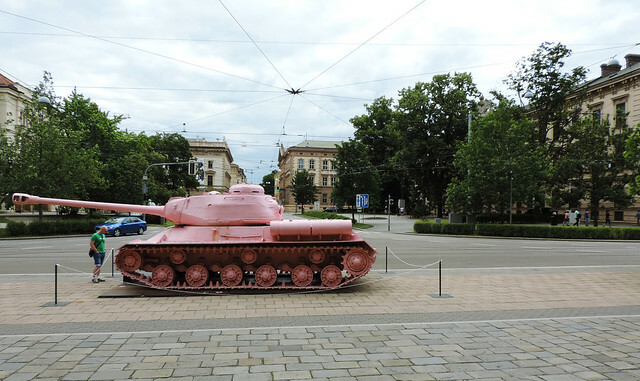 As serious fans of old towns and architecture, Brno was love at first sight for us: medieval and classical architecture, giant cathedrals, charming little streets and fountains… And a pink tank. And a giant horse statue. And some smaller, funny statues. Petrov Hill. The views from Špilberk Castle. If the medieval Old Town Hall wouldn’t have been enough to impress, a music band started to play at the top of its tower around noon. 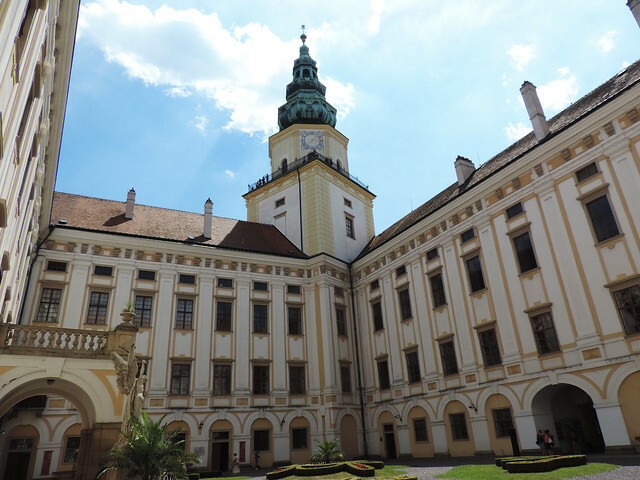 Veveří, one of the oldest castles in the Czech Republic is only 30 minutes drive from Brno. 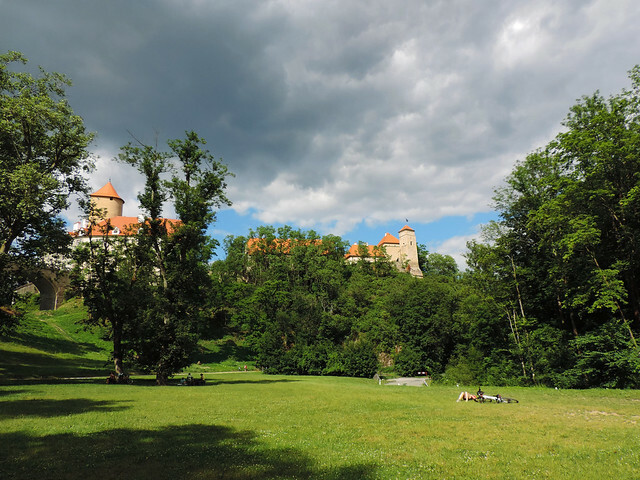 This more than 800 years old fortress rises above the Podkomorské Woods and whoever has built it chose the most picturesque hill at the bend of River Svratka. A short walk leads up to the entrance from the roadside parking lot and several other trails tempt you into the woods. 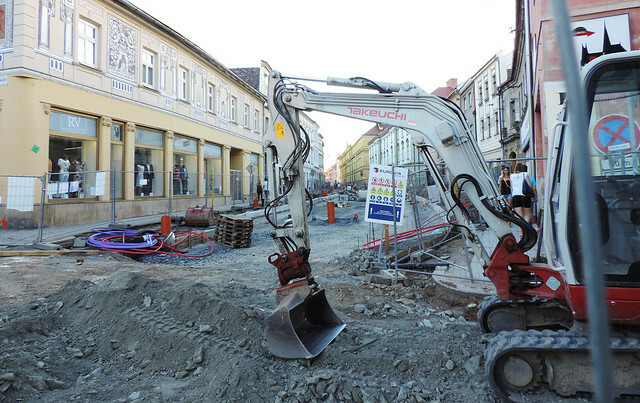 Olomouc: the wrong place or the wrong time? So often we use the words impressed, surprised and even shocked when we tell you about a place. Well, the city of Olomouc has definitely shocked us but not in the usual way. Most of the old town was one huge reconstruction area at the time of our visit. 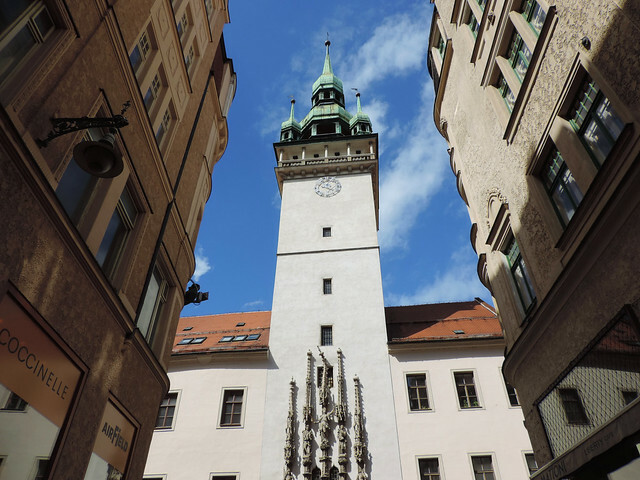 Including its famous Town Hall with the astronomical clock – they were all covered. It was not even an easy task to walk anywhere. And the funniest thing: the streets that were not barricaded due to the reconstruction were closed to both cars and pedestrians because of a running event held on that exact day. Though we’ve been to Olomouc I wouldn’t dare saying we’ve seen it. But next time we go by, everything should be pretty and shiny, deal? After the unpleasant surprise in Olomouc we were happy to have a pleasant one in Kroměříž. We visited this small town because of its UNESCO World Heritage listed Archbishop’s Chateau in the first place. We did find an impressive chateau there but a picturesque, cute small town, too. Read more about our visit to Kroměříž here! Unlike other medieval castles, Bouzov is in a wonderful condition inside and out. Thanks to a massive reconstruction in the 19th century, the Neo-Gothic seat of the Order of the Teutonic Knights is standing proud today. It’s also fully furnished and equipped. The temptation to get a taste of the Middle Ages in this castle is very strong and we had one of our most unique castle experiences there. 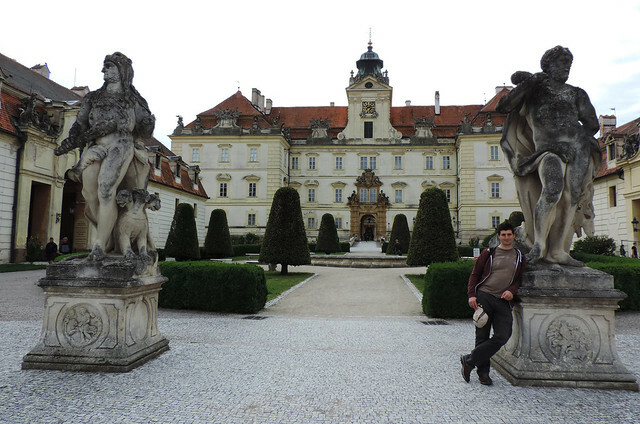 Read more about our visit to Bouzov Castle here! 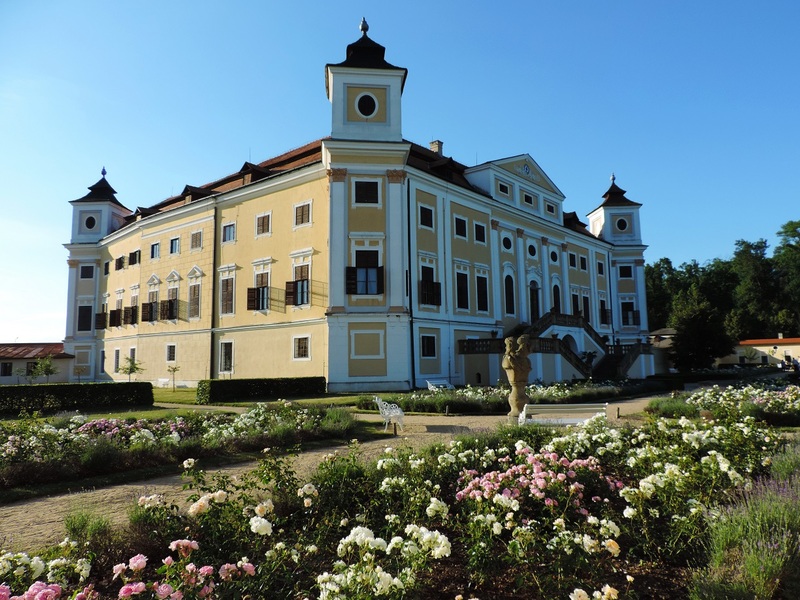 Half an hour drive from Brno lies a tiny town with a stunning Baroque residence: Lysice. We bumped into a small fair in its first courtyard and an old style sports car in the second courtyard. Lysice is another castle where we liked the interiors even more than the castle building itself. Actually, its richly furnished interior is quite young. It originates from the 19th century and it gave us an idea about the lifestyle of the wealthy Dubský family. We especially liked the library, the glass and porcelain works displayed in the rooms and the small chapel. Well, that’s what we explored… so far. But we can’t wait to be back in the Czech Republic! We have the towns of Karlovy Vary, Český Krumlov and Telč, the Moravian Karst and Krkonoše National Park on our dream list. And of course, some castles whose names we can’t even pronounce – like Hluboká nad Vltavou. In our opinion the best way to explore all the hidden corners of Moravia is by car. Brno, Olomouc and all the other small towns are easily walkable but getting from one place to another took us usually 30-40 minutes by car on the narrow roads. Brno and Olomouc can be accessed on motorway but not the rural castles. The landscape is a nice reward wherever you drive though! Want to rent a car in the Czech Republic? Here are some useful tips and great deals! Booking tickets for the castle tours in advance is not needed at all if you visit them individually. We usually just signed up for the following tour once we got there. Waiting in line was never a problem – these are hidden gems, remember? Opening hours vary depending on the season and a lot of castles are closed for winter. Be sure to check their website for the most up to date info! Have you ever been to the Czech Republic? Would you explore Moravia?